On the afternoon of April 20, 1910, A. Holland Forbes of the New York Aero Club, along with John Parker and William Hull, were making a balloon ascension from Court Square in Springfield, Massachusetts, when the balloon veered towards a tall tree. The balloon struck the tree-top which was about 100 feet off the ground, and was briefly caught in the upper branches. When it broke free, it began swiftly heading towards the upper floors of a nearby apartment building. Mr. Forbes immediately tossed out several hundred pounds of sand-ballast which caused the balloon to abruptly rise straight upwards barely missing the building. 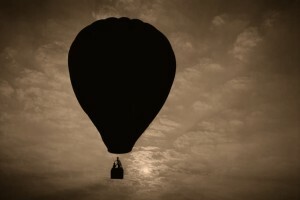 The balloon later landed in Hadley, Massachusetts, about twenty-five miles distant.